The new Audi Q3 is a versatile family SUV. The second generation has a more dominant design. The model is more spacious and versatile. Like premium models at the top of the Audi range, the Q3 features a fully digitized operating system and display, infotainment solutions, and innovative support systems. All these enhance comfort, along with optimized suspensions. The new Audi Q3 will reach European dealerships from November 2018. The new Audi Q3 has a more sporty design than its predecessor, including the Singleframe radiator grille, which has an octagonal design with vertical blades, but also thanks to large air intakes. These are the details that particularly mark the male front section, accentuated by the intense play between lights and shadows. The narrow and triangular headlights are directed inwards. Audi offers three versions of headlights. The top version is the Matrix LED technology with adaptive road lights that illuminate the road in intelligent fashion. The profile emphasizes the balance of the exterior design, thanks to the symmetrical illuminated graphics of the headlamps and rear optical blocks. The "shoulders" line connects them from a stylistic perspective and gives a general athletic impression, with "muscles" heavily contoured above the wheel passages. Contours are inspired by the Audi quattro DNA and give the model a wider visual range. Wheel flashes have a contrasting color to highlight the off-road design. The D slopes, supported by the elongated slider, which descends to the side of the rear window, also creates the impression of dynamism. Tension lines, three-dimensional elements: the interior continues the design of the exterior and reminds, in many ways, the top premium models of the brand. The architecture fits perfectly with the new car concept. The centerpiece is the MMI touch display, framed by a glossy black glass frame. In addition to the air conditioning control unit underneath, the MMI touch is 10 degrees to the driver. All displays, buttons and controls have ergonomic positions. Comfortable seats allow a sporty position with the steering wheel at the right angle. 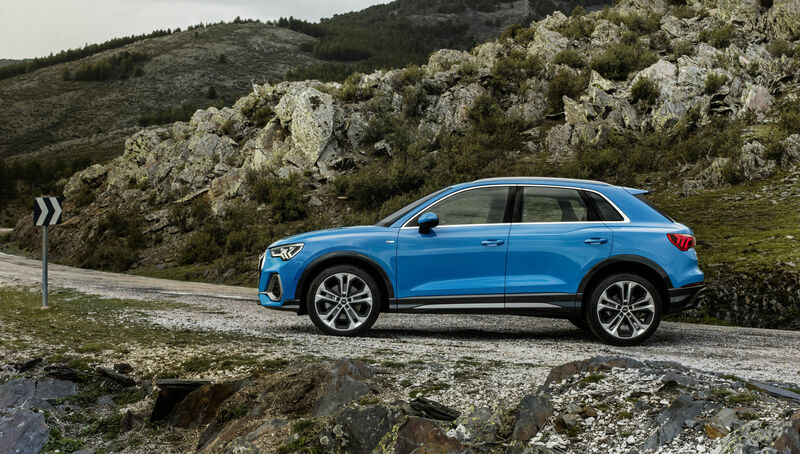 Compared to the predecessor model, the new Audi Q3 grew practically in all directions. It has a length of 4.485 millimeters, a width of 1.856 millimeters and a height of 1.585 millimeters. The wheelbase, increased by 77 millimeters, allows a generous and versatile interior space: the rear seats can be moved to the front and rear by 150 millimeters. The 40:20:40 split backs can be tilted in seven positions. Depending on the position of the rear seats and their backrests, the luggage capacity varies between 530 and 1,525 liters. The boot floor can be adjusted to three levels and the luggage compartment cover can be placed under the floor when not in use. The electric tailgate, which can be opened and closed by simply moving the foot, is available as an optional extra. The concept of operation and display has been refined in detail. Thus, it is found that Audi has completely surpassed the analogue. Even the basic equipment includes a 10.25 inch diagonal screen toolbar. The driver uses it via the multifunction steering wheel. With the MMI plus navigation system, which is the top-of-the-line option, the Audi virtual cockpit, which also offers many additional functions, is displayed. An additional 10.1-inch touch screen is also available. Optionally, the driver can choose the Audi virtual cockpit plus display, which is bigger and offers three different display modes, including a new, particularly sporty screen. The intuitive operating concept with the flattened menu structure is complemented by the voice command with the ability to "understand" the usual language, as well as the words spoken in a free structure. The ingenious dialogue manager asks questions when needed, allows for corrections, offers options and does not object even when interrupted. The top-of-the-line infotainment system for the Audi Q3 offers the same features as in the upper segments. The data transfer module supports the LTE Advanced standard and integrates a WiFi hotspot for the mobile devices of the passengers. The navigation system recognizes the preferences of the driver on the basis of previous trips and can make appropriate route suggestions. The Audi Connect range complements the on-line traffic information navigation as well as the search function for points of interest and information about parking spaces and power stations that appear directly on the navigation map. The Audi Q3 makes use of the Audi fleet's intelligence intelligence to predict the availability of roadside parking lots as well as to provide information on areas with risky obstacles and current speed limitations. Other options include Google Earth and the hybrid radio system, which automatically switches between FM, DAB, and on-line streaming to ensure optimal reception at all times. The voice command function accesses the information stored in the car as well as detailed cloud information to give the appropriate response. The Audi Q3 ensures even deeper integration of myAudi. It fully interconnects your smartphone with your car. The client can, for example, transfer the navigation and smartphone agenda to the MMI and can see where Q3 is parked. Several hardware modules complement the range of infotainment functions. These include the Audi phone box. This equipment connects the owner's smartphone to the car's antenna and charges the inductive phone. The Audi interface for smartphones lets you connect your client's iOS and Android mobile phones and plays the Apple Car Play or Android Auto interfaces on the MMI screen. The Bang & Olufsen Premium sound system with three-dimensional virtual sound has a total of 15 speakers. Adaptive cruise assistance is among the assistance systems. It is a system that incorporates the functions of adaptive assist assistants, traffic jam assist and active lane assist. Thus, the system assists the driver by controlling the longitudinal and lateral car and increases comfort, especially on long journeys. The Audi Q3 simplifies the maneuvering of the four 360-degree cameras. These show the area around the SUV, displaying it on the big screen of the infotainment system. On this screen, the driver can also track the park assist maneuvers. The park assist parking system directs the car automatically to and from the parking spaces. The driver just needs to accelerate, brake and change the gears. When the driver wants to get backwards from a parallel parking space or from a narrow access road, cross traffic assistance is activated. The radar sensors that the system uses to monitor the area behind the car also provide the necessary information for the tread change maneuvering function. If the system detects a vehicle at a dead angle or a vehicle approaching high speed from the rear, a warning LED on the corresponding exterior mirror illuminates.